From their humble origins back at the beginning of Arc V, this archetype has remained steadfast in its dedication to mash and smash. But do you really understand how to build Superheavy Samurai or what they are actually capable of? PS: This article was totally called CDS: Gorgonzola until the last minute, but I just had to remove the pun exactly how the TCG eliminated every single pun from the OCG names for these monsters. It’s all in the spirit of poetic justice folks. The Superheavy Samurai archetype is one of the craziest experiments in the Arc V anime, as it is literally an archetype designed to be played without Spells or Traps. Forced deck design aside, this archetype actually has quite a few tricks up its sleeve to ensure that the deck can function rather effectively. The best part about this archetype is that they carry a second gimmick that sets them apart – the archetype is all about attacking from Defense Position! In the anime, Gong Strong is the character that uses the archetype and is extremely proud and stubborn about the fact that his deck is all about holding firm against any of his opponent’s offensive tactics. But is that truly the most effective way to build and play with these Superheavy Samurai? It’s time to leave the anime tactics session behind, since it is time for you to learn the Superheavy code. To begin your lesson, the Superheavy Samurai fall into a few different categories. You have your boss monsters which all have the ability to attack from Defense Position, you have your ‘enhancers’ which all add extra abilities or strength by equipping to your monsters, you have a core set of utility monsters, and then finally you have your tuners. The perfect Superheavy Samurai decklist strives to strike a balance between each of these categories, without going overboard in a specific category. It is a balancing act worthy of the best juggler from the circus, so in other words, not you Yuya. So let’s begin by introducing you to what you should be using from the first category Superheavy Samurai Big Benkei is the absolute boss monster of the archetype, clocking in at 3500 DEF and an effect that lets ALL of your Samurai to attack from Defense Position! In the past, he was the clear endgame for the Samurai, but he definitely still sticks around in a modern version of the deck. Outside of Big Benkei, you really don’t need any more Main Deck boss monsters, because that is the role of your Synchro monsters! Each of the on-theme Synchros can attack from Defense Position, and their DEF can range from 2300 up to 7000! They provide the oomph that you need to win battles, strike down your opponent’s LP, and force the opponent into over-committing to the field. I’m sure you’ve run into many of these in the past, but I’ve listed them all for you in the decklist later on. The second category of Superheavy Samurai is what I like to call the ‘enhancers’. To be blunt, this is by far the largest grouping of monsters, but most of them fall squarely into what is defined to be ‘useless’ support, because they are so highly conditional. But for the ones that we do use, they literally carry the deck to viability entirely on their own thick shoulders. Superheavy Samurai Soulpiercer is first up on my list, because it is the heart and soul of the deck. Whenever it is sent from the Field to the Graveyard, you get to add any Superheavy Samurai from the deck to the hand. The best part is that it can even trigger when it is sent while being equipped, since it equips itself to a Samurai from the hand or field! The side benefit to this enhancer is that it also gives the equipped Samurai piercing, as foreshadowed by its name. This will definitely become more important as we continue introducing the important monsters. The next enhancer that I’d like to introduce is Superheavy Samurai Soulbuster Gauntlet. While it can equip just like Piercer, you don’t actually ever want to, because it only grants 400 DEF when equipped. So what is it useful for? Gauntlet shines as the Honest of the archetype, since you can discard it to double the original DEF of a battling Superheavy Samurai. So that makes Big Benkei a 7000 DEF attacker, or Superheavy Samurai Warlord Susanowo becomes a 7600 DEF attacker. While this is just okay on its own, when you add in the next enhancer, it becomes even more potent! Meet Superheavy Samurai Soulhorns. Again, you can equip it from the field or hand, but this time it gives the equipped Samurai double attacking! Yes, with Gauntlet and Horns, you turn Benkei into a 7000 DEF double attacker. You can even Special Summon Horns from the Spell/Trap zone while it is equipped, giving you Tribute Material, an additional Level for Synchro Summons, or just to get another monster on the field in a pinch. The last enhancer you should be using is the most recent addition to the archetype, the card designed to round out the theme. Superheavy Samurai Soul Arbitrator can equip to any Samurai, turning said Samurai into a Lonefire Blossom for Samurais. It can even summon your Big Benkei straight out of the deck, and if you happen to equip and tribute a Soulpiercer, you even get a free search out of the deal as well! That prior category was definitely full of important cards, but it really is the utility cards that make the deck successful without Spells or Traps. First up is a card that should be in every single monster mash deck, Superheavy Samurai Thief. It can Special Summon itself from the hand for free as long as you have no Spells or Traps in the Graveyard, and it can tribute itself to literally steal any Spell or Trap OR Pendulum Spell that your opponent controls. What makes him even better is that it doesn’t target, plus you can even choose to destroy and steal a card that your opponent chains! Next on our list is the best monster of the archetype, Superheavy Samurai Scales. Whenever it is Normal or Special Summoned, you can Special Summon any other Level 4 or lower Samurai from your Graveyard. It even can Special Summon itself from the hand if your opponent controls 2 monsters while you have open monster zones! Be sure to note that this lets you bring back any of your enhancers and immediately ‘enhance’ your Scales, you could just bring back Piercer for a free search down the road, you could bring back any Level 4 for a R4NK Xyz Summon, you could bring back a tuner for a Synchro Summon, or you could even just bring back any Samurai to use as Tribute Materials for Big Benkei. The utility he brings is versatility, and Scales is almost always the Samurai you initially search with Piercer. Our next utility Samurai is Superheavy Samurai General Coral, and this is your themed draw power for the deck. You can tribute up to 2 Samurai from your field (which can include itself) to draw the same number of cards. While it is a Pendulum monster, you generally will only use its Pendulum Effect as a backup Horns in the case that you need the second attack on your Big Benkei. There is one more utility Samurai to cover, but I need to cover the tuners first for you to actually consider it viable. Onto our Tuner Superheavy Samurai, the final category of Superheavy monsters. Your first is Superheavy Samurai Trumpeter. Just like Thief, you can Special Summon it from the hand if you have no Spells or Traps in the Graveyard, but Trumpeter has a different second effect. Whenever it is tributed for a Tribute Summon (which should pretty much only be Big Benkei), it gets to Special Summon itself back to the field. But again, its key characteristic is being a tuner, so you will most definitely be using it mainly for that purpose. Next up on our list is Superheavy Samurai Drums. While it cannot Special Summon itself from the hand like Trumpet, it does Special Summon any Samurai from your Graveyard whenever it is destroyed by battle. Sure, it is a bit of a slower recovery card, but it can Special Summon any of the Synchros or Big Benkei, giving itself a bit of a separate niche from Scales. Last up for our tuners is Superheavy Samurai Battleball. This tuner is unique in that it uses a monster your opponent controls as the second Synchro Material, whether or not that monster is a tuner itself! Since you have a variety of Levels for your Synchros, you can effectively use Battleball as monster removal for any Level 3, 4, 6, 7, or 8 monster your opponent controls. The only monsters that are safe are the ones that cannot be targeted! I promised a return to the greatest utility Samurai, so let’s talk about your final monster that earns its three slots in the Main Deck: Superheavy Samurai Transporter. Just like Thief and Trumpeter, it can be Special Summoned from the hand just for having no Spells or Traps in your Graveyard. The more ‘seemingly bad but actually sleeper OP’ effect is its main ability: it can tribute itself to Special Summon up to 2 monsters from your hand to your opponent’s field, then you draw the same number of cards. Overall, its effect is a -1 in card advantage: for any draw card that does not bode well. But, I’d like you to keep an open mind, because this is absolutely one of the dark horse key cards of the deck. Why? Because if you are smart about it, you can always turn that negative into a positive or perhaps even a game-win. By giving your opponent 2 monsters, you automatically have a way to bring out Scales using its own effect, giving you 2 monsters on your field before you even Normal Summon for the turn. Or you could choose to give your opponent a monster to immediately use for a Synchro Summon due to Battleball. Either of these cancel out your -1 right away, and you can even plus if you do both in the same play! The Samurai also have monsters that want to be destroyed, so you could even take an entirely different route by giving your opponent Drums and Piercer, so when you destroy them during the Battle Phase, you can get two more pluses. Fold this play into our combo, and you just took an initial -1 and turned it into a +4. Sure, to pull off something that amazing you need a great setup. But any part of that big play can be executed for gains in card advantage. The other option is to simply give your opponent weak monsters to run over with a double attacking, 7000 DEF, piercing Big Benkei. While that doesn’t quite giving you the card advantage, it does give you a game win. All of the effects I’ve described – this is what makes a Superheavy Samurai deck tick. This constitutes the power plays, this constitutes the advantage potential; all in all, this is simply a composition that outlines the sheer power the deck has when built purely. Are there more Samurais you can use? Of course. But the above are the ones I have found to be the most useful. I’ve included a couple more in the Additional Tech section later on if you would like to see the borderline useful options and a bit of explanation and theory. At any rate, I’m going to switch the traditional format up a bit by showcasing a sample decklist from the start to give you something to think about for the rest of the article. Click on the spoiler below to check out my sample list. (I’ve shortened Superheavy Samurai to SS for my benefit). What does this archetype DO? You’ve seen the deck, you’ve seen how I’ve incorporated some outside tech cards, but the question can easily be raised – what does this deck do well? The Superheavy Samurai are definitely a unique archetype, and you can’t exactly compare them to anything else, but they do put surprise damage onto the board rather effectively. Also, the ability to use your opponent’s Spells and Traps against them is a great niche for the archetype. Remember, many decks are running copious amounts of backrow removal, sometimes triple Twin Twister alongside a couple other cards. And that tech alongside others is pretty much useless, outside of killing off equipped Samurais. The other niche is the Samurai’s ability to create card advantage out of nowhere due to Transporter. Finally, they may not be able to float as well as the Kozmo spaceships, but they definitely have a couple of floating chains that let you defend your LP while also searching out the monster(s) you need. This is a unique combination of characteristics, and it provides the Samurai with its own niche within the ever-increasing number of archetypes in the game. The best part? The theme can only continue to get better from here, because Gong is still a member of the Lancers and a common character in the Arc V anime. While I don’t think we will ever get as many Superheavy Samurais as Performapals, I’d bet that we’ll get at least one or two more Samurai to round out and expand the archetype to an even wider effect pool. Many of these tech options fill a variety of holes left by the major Superheavy Samurai monsters. But they also can add new dimensions to your archetype, as I’ve also included a couple engines to consider. At any rate, check these out because they can impact your personal build. Superheavy Samurai Flutist – Another monster that used to be key to the deck’s strategy, the best part of Flutist is being able to get any of your Samurai out of the hand that can’t do so themselves or just to avoid the ‘you can only Special Samurai for the rest fo the turn’ restriction. Its second effect is really the only benefit to the deck now, protecting your Benkei or Susanowo from targeting effects. Superheavy Samurai General Jade – The other half of the Samurai Pendulum duo, this general is effectively a weaker Benkei that can be summoned with only 1 tribute. Also, it only lets itself attack from DEF position. If you are running a build without Transporter, you can consider running just this as your main boss monster, but the ability to Battleball a Transported Benkei for Susanowo is generally too important. Superheavy Samurai Magnet – Effectively a Maurading Captain for the archetype, Magnet helps you get even more Samurai to the field. It also forms a soft lock when you are desperate. I really don’t think this card is all too useful, but it can shine in very specific situations. Superheavy Samurai Soulbang Cannon – This is an enhancer that gives one of your SS monsters a 1000 DEF boost. But its more important effect is the Graveyard one. If your opponent tries any funny business in the Battle Phase, you can destroy all monsters on the field and inflict 1000 damage to both players. The other upside to this card is that it is Level 3, so Synchro plays into Musha – C is a possibility. Superheavy Samurai Gigagloves – This utility Samurai used to be one of the key cards in early versions of the deck, but just like Flutist, it seems to have fallen out of favor. Being able to disrupt an opponent’s attack is great, and it is also amazing to be able to set your future. Add onto that the benefits of being Level 3… Yeah, there is a ton of potential here, but if you do choose to run this, you also need to be using Mathematician to get the most benefit out of it. Superheavy Samurai Soulclaw – This enhancer adds protection from battle and a lovely 500 ATK and DEF. But most of all, it can Special Summon itself just like Soulhorns, so you could have another monster that has all of the benefits I discussed earlier. Superheavy Samurai Prepped Defense – Our final SS Tech option, this is the themed hand-trap to end your opponent’s aggression. It also is a Level 3, and has nice DEF to boot to attack with if you have Big Benkei out on the field! Machina Gearframe, Machina Fortress, Machina Megaform – The Machina engine is also an addition that could work out pretty well for the deck. The one downside is that it takes a considerable amount of deckspace and you already have enough things to Normal Summon as is. But at the end of the day, they form a great Machine-type engine. Metalfoes Engine – If you wanted to actually use Pendulum Summoning, this is the way to go. You may question this at first, since the Metalfoes Pendulums require you to use Spells and Traps. But when you realize that Metalfoes Fusion is the only one you should run and it even recycles itself, you will quickly see just how amazing this combination can be. (It’s great, and totally a variant of its own: I fully encourage you to test it out). Kaiju Engine – By running Gamaciel, Dogoran, and Slumber, you can actually give yourself even better monster removal while also unlocking access to Susanowo so easily. Since Battleball and all. Slumber is even a Spell that banishes itself from the Graveyard, it is a perfect match made in heaven! Just remember, you will need to adjust your extra deck to accommodate more Susanowo to make this strategy successful. Fire Hand, Ice Hand – Need S/T or monster removal? These two do so without relying upon a Special Summon, letting you get out of Vanity’s Emptiness or a Barrier Statue. Giant Rat – While it is a bit of a slower searcher, Rat can bring out pretty much any of your important Samurai, even Superheavy Samurai Big Benkei. In the past, it was considered mandatory, but with Arbitrator, I’ve found it to fill a better role as just a tech option for those that want a bit more deck thinning. Ruffian Railcar – No, we are not using the other trains. But Railcar can still search out your Superheavy Samurai Thief, and a searcher for a monster that gives you a pure +1 in card advantage is great. Gorz, the Emmisary of Darkness – You’re running no Spells or Traps, so pretty much an easy summon if your opponent attacks direct. Also, many duelists don’t expect him anymore. The downside is that he clashes with Thief and Susanowo. Effect Veiler – Another monster-effect disruption option, and Veiler is a frequent player when it comes to being included. You could even fit in a small Sage with Eyes of Blue and Dragon Spirit of White engine if you really wanted, but that may just be reaching a bit too far. Galaxy Cyclone – It’s a Spell that gets itself out of the Graveyard, so perfect for the Samurai. But it can only banish itself to kill a face-up Spell or Trap, so it could become dead weight if your opponent runs no Pendulums, Field Spells, or Continuous Spells/Traps. Bait Doll – A better version of Cyclone for Samurai, since it never goes to the Graveyard. Breakthrough Skill – Much easier to guarantee to leave the Graveyard, Breakthrough is an excellent option for the deck if you want to use a couple traps and if you don’t want to rely soley on stealing your opponent’s. Marmitting Captain – In my humble opinion, this is by and large a better version of Superheavy Samurai Magnet. The only downside is that it isn’t a SS monster. But it can easily bring out Big Benkei from the hand, since you are guaranteed to draw a monster. Gallis, the Star Beast – Full monster deck, so this is a shoe-in if you just want more monsters to hit the field. The good news is that it combos well with Trumpeter or Battleball to make Musha – C, but outside of that, it just serves in a Tribute Fodder role. Sephalyon, the Ultimate Timelord – You are running 40 monsters, so why not run a boss monster that capitalizes on that fact. Easy to summon and it is a powerhouse. Just consider it. Wrecker Panda – My favorite card for monster mash variants since the ATK gain is permanent. So after a couple turns, you could end up hitting insane ATK values on a Level 2 monster. Genex Ally Birdman – Machine-type tuner to be used for your Superheavy Synchros, also it helps you get cards back to the hand that you Special Summon with Scales. Construction Train Signal Red – This is the generic battle hand-trap that can be substituted for Prepped Defense. It fills a similar role, while also being able to protect against an attack on a monster. Rise to Full Height – A DEF doubling trap card that also banishes itself from the Graveyard? Count me in! This is a game-changing card, but the re-setting of DEF to 0 at the End Phase can be a bit sad for your Samurai if you do not OTK. But at any rate, consider this backrow when building Samurai. As always, the list above is just my personal build. Hopefully you can learn how to be steadfast and strong like Gong! Or you could just try to figure out how to incorporate some of these monsters into a functional monster mash! The true test of character is figuring out how to use the long list of tech options I just listed to create your own spin on the deck. Until the next time, keep innovating and building creative decks! Most of all, just enjoy dueling for the fun that it can be! Reminder, I also take suggestions for future CDS articles! While I will not run out of cool ideas, I do want to be writing articles about strategies you are interested in. 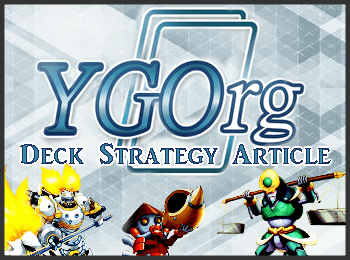 So if you desperately wish to see a CDS article about the archetype, theme, or strategy you love, feel free to private message me on the YGOrg Discord server or the YGOrganization Forums with your ideas to keep under consideration: my username is Quincymccoy. Hello everybody! I serve as Number VIII of the Organization; however, my main role on the site is writing regular Deck Strategy articles! I enjoy fleshing out archetypes to their fullest potential and helping people discover amazing new techs and decks to try out!